Providing several types of catering set ups such as Live Cooking Stations, Buffets, Canapés, with or without serving staff for gatherings of 5 to 200 persons. 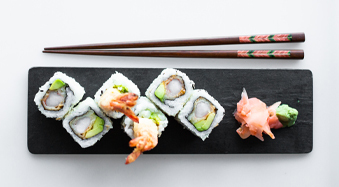 Our catering service is an affordable option for Abu Dhabi and Dubai residents to enjoy gourmet Japanese cuisine with assisting services in the comfort and coziness of their homes. For private events, corporate parties and other events in locations without kitchen services or where the experience requires something unique, we have a fantastic mobile unit which is an easily assembled sushi bar designed and engineered to offer a live cooking show. Our Direct Supply services are designed to provide corporate customers with tailor made dishes for banquets, corporate cafeterias, buffets, among others. 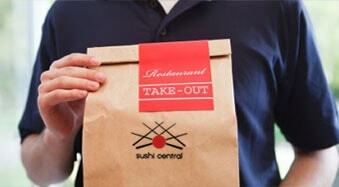 The delivery service across Abu Dhabi offers an extensive menu to your home or office. 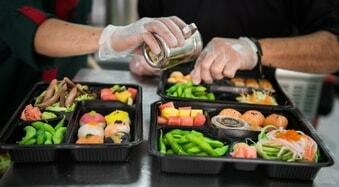 Our stylish packaging has been designed to protect the delicacy of our sushi and assures the highest quality and freshness of food on arrival. 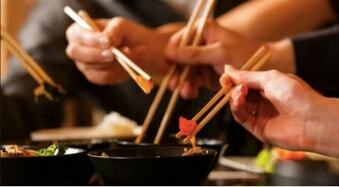 Our Dine-in experience provides a wide range of hot and cold dishes, from traditional to unique modern recipes. Our restaurants are designed to be family friendly with a comfortable and modern setting.